A Robertshaw 9600 is a popular budget-priced programmable thermostat. A programmable thermostat can help you save money on your heating and cooling bill by allowing you to reduce the heating or cooling in your home automatically when you are away or asleep. The Robertshaw comes with many useful features, such as an LED readout and freeze protection, which automatically turns the heat on if the temperature drops below 40 degrees. The Robertshaw 9600 has two mode switches, which engage the heating or cooling modes of the thermostat — telling the furnace or air conditioner to start up or shut down. One problem with these switches is that they are not covered, which means air can reach them and cause the copper contacts on the switches to corrode. When this happens, the thermostat will not turn the heating or cooling on at the appropriate times. Cleaning the copper contacts on the switches can restore the thermostat to working order. The fan switch, which controls when the fan turns on and off, can also become corroded and prevent the fan from turning on and off when it is supposed to. To prevent any of the switches from becoming corroded, you can use a toothpick to apply anti-oxidation compound to the contact surfaces of the switches. Use just enough compound to cover the contacts. If the temperature-sensing diode, located on the thermostat's circuit board, becomes disconnected or fails, this can cause the thermostat to malfunction. In this case, the furnace or air conditioner will fail to turn on at the preset temperature, or will turn on at the wrong time. If the soldering on the circuit board of your thermostat is of poor quality, the temperature sensing diode can easily become disconnected. This will need to be resoldered. 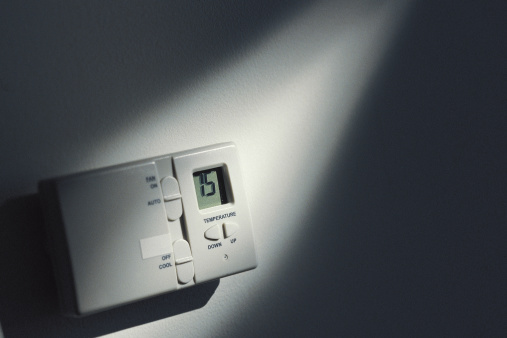 If the thermostat turns on and off too frequently, it may be that the temperature differential is too small for your conditions. The temperature differential is preset to 1 degree F, so that the system will turn on whenever the temperature in the room changes from the setting by one degree. Increasing the temperature differential to more than 1 degree F means the furnace or air conditioner will turn on less frequently.